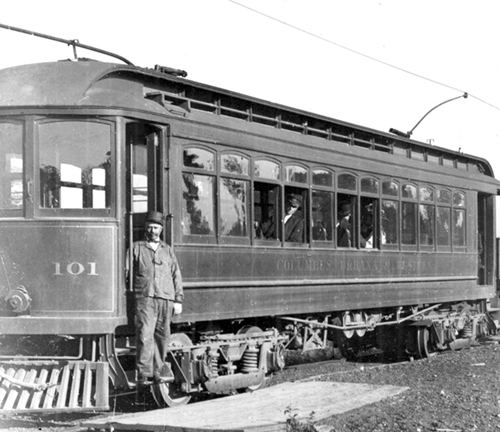 CU&W interurban car No. 101, location unknown. photo from the Galen Gonser Collection. Columbus Urbana & Western Electric Railway Co. The CU&W interurban was another Columbus interurban line that started with great promise but fell short of those hopes. Only nine miles were actually built from the the intersection of Water and Gay Streets in Columbus to Fishinger Road in Upper Arlington. The standard gauge road operated from 1903 to 1925 when it became the victim of automobiles, improved highways, little to no freight business and limited patronage. The line travelled north on Water Street to Spring Street where it turned west. On Spring Street the line passed its car house at 500 W. Spring Street and the Columbus Municipal Light Plant at 555 W. Spring Street. The line then crossed the Olentangy River on its own bridge. The line then followed along the side of what is now Route 33 going past Marble Cliff, Griggs Dam and on to Fishinger Road. The end of line was known as Fishinger's Bridge which carried Fishinger Road over the Scioto River. In 1905 Columbus completed Griggs Dam on the Scioto River near Upper Arlington giving Columbus a much needed reliable water supply. The new structure gave the CU&W a boost in passenger business as city folk would grab their picnic basket and take the “Dam Car” to Griggs Dam for a country outing. A welcome relief from the coal smoke infused air of Columbus. 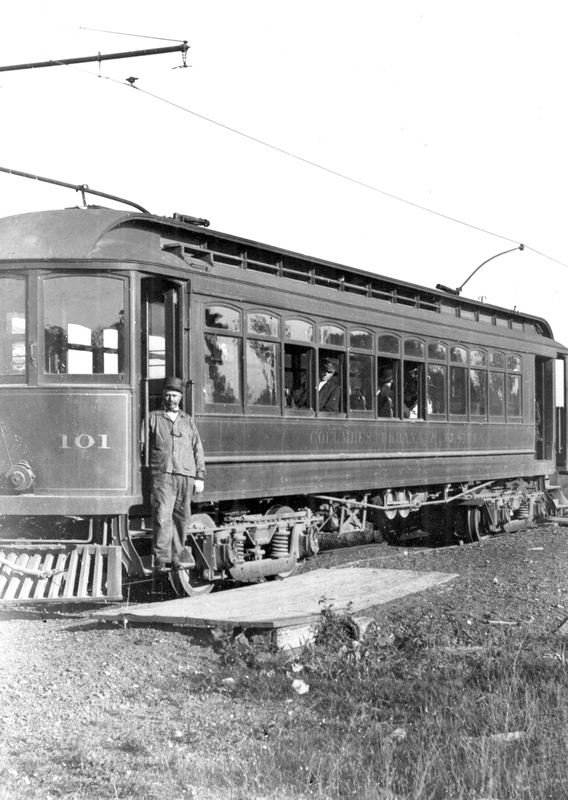 The little interurban had three passenger cars, Nos. 101-103, one work car and 15 trailer service cars. The trailer service cars were probably used to haul rock from the Marble Cliff Quarry located along the CU&W. The line had no depots for passengers just loading platforms and at the Columbus end simply the street. Power for the railroad was purchased from the Columbus Railway Power & Light Co. The 1913 schedule lists a shuttle service from Fishinger's Bridge to Hilliard and Dublin. By 1924 a stop at the new O’Shaughnessy Dam (upriver from Griggs Dam) was added to the shuttle service. O’Shaughnessy was another attractive picnic spot. The intersection of Water & Gay Streets in Columbus formed the northwest corner of the Columbus interurban loop. It was next to the CD&M Station at 100 W. Gay Street where the CU&W had its offices. In 1912 the Ohio Electric Railway built a new Interurban Terminal on Third Street between Rich and Town Streets no longer using the loop. In 1919 the CD&M, by than the only interurban still using the old interuban loop moved to the new Interurban Terminal leaving the CU&W isolated at their Water and Gay streets location. By 1925 Route 33 had been improved and automobiles were common enough that the Dam Car line was abandoned. In the 1930s Water St. was renamed Marconi Blvd.